Beethoven's Fifth Symphony is one of the most recognizable pieces of music ever written. With numerous appearances in popular culture including movies, television, rock & roll and disco, it stands alone as the most popular of Beethoven's nine symphonies. This special treat will enable musicians of all ages to experience the genius of Beethoven's most significant work as either a solo performance or any assorted instrumental combination as Jonathon Robbins arranged this masterpiece for Trumpet, Clarinet, Alto Sax, Trombone & Flute or Violin with piano accompaniment in accommodating keys. 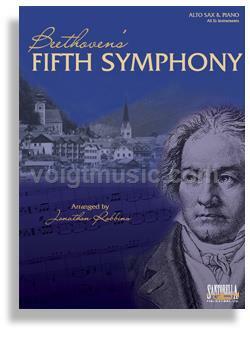 This famous Beethoven classic theme published by Santorella Publications is a great addition to our “ever-strong” instrumental solo library. Beethoven's Fifth was first performed in Vienna in 1808, but was not initially recognized as an innovative piece of music. This was mostly due to poor conditions at this 1st performance that included a frigid-cold theater and a poorly prepared orchestra. Even though the debut left critics with mixed opinions, people soon realized it was unlike anything they had heard before. In addition to the emotional impact of bold opening movement, the symphony is technically progressive. One innovative element is the repetition of the rhythm of the famous, four note opening throughout the symphony, unifying all three movements. Incorporating a piccolo, the double bassoon and the use of three trombones in the final movement showcased his genius.